Cook vermicelli as directed on package. Meanwhile, coarsely chop capers if they are large. 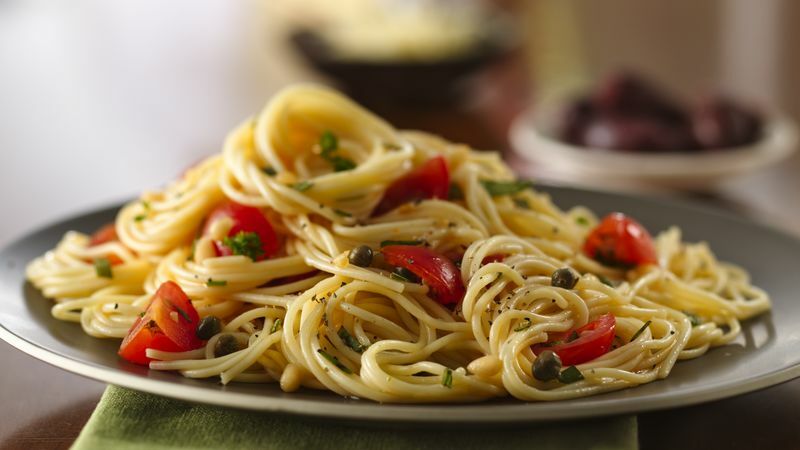 In medium bowl, mix capers and remaining ingredients except tomatoes and pepper. Stir in tomatoes. Drain vermicelli. In large bowl, toss vermicelli and herb mixture. Sprinkle with pepper. Because the ingredients in this recipe are uncooked, they'll stay warmer if you toss them with the pasta in a prewarmed bowl. To warm your serving bowl, fill it with hot water and let it stand while the pasta is cooking. Pour the water out just before you're ready to add the pasta.